A case study of Hans Christian Andersen’s Snow Queen for the Xbox generation. Digital marketing is imperative in attracting a young audience. Children are natural early-adopters of digital technology. When running an arts centre for children and families, we need to be speaking the same language as the digital natives we are serving. If we play it right, we can use digital technology to reach new audiences that we wouldn't otherwise reach. The key is embedding digital creative activity right through a project, like a stick of rock. In December 2015, Manchester's specialist venue for contemporary family arts Z-arts staged the UK premiere of a multi-venue co-production of Hans Christian Andersen's Snow Queen. It was part of a long-term mission to use theatre and digital arts to reflect and cater for the diverse 21st Century family. Making storytelling relevant to young people and their families living in the modern world, audiences are the driving force behind all work produced at our family-focused venue. So how did young people relate to a story of make-believe written in 1844? Through consultation with children and young people, we ended up with a version of Snow Queen that fast forwards nearly two centuries to reside in a world of online viruses, interactive gaming and social media identities. The design was influenced by gaming technology, using projection mapping animation for the actors and puppets to interact with. Merging live performance with digital augmented reality, the two worlds of everyday city living and the magical land of the Snow Queen were brought together using distinct landscapes. 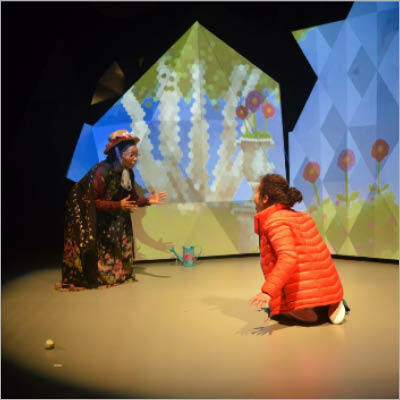 The digital landscape of the Snow Queen was also used to create an interactive online world where potential audience members could engage with the characters and influence their journeys in the months leading up to the performance.